Holy Spirit arrested my attention one morning whilst I was out for a prayer walk. Headphones in my ears, listening to the message version of the Bible. As I listened to Matthew chapter 5 I was so challenged by Jesus’ preaching that I started to question my own salvation. Yikes! I’m in trouble. I started thinking of all the drivers on the road who I regularly call “idiots” when they cut me up. Jesus’ teaching is not only challenging, it’s hard and dare I say verging on impossible to live. Let’s be honest, even if we don’t call people “idiot” or “stupid” how many of us think it? How on earth do we live out these high standards God requires from us? Even Jesus’ disciples questioned this, but read Jesus’ response. God knows we can’t do it in our own strength and He never intended us to try, which is why He sent us a helper. We can only fulfil His commands through the power of the Holy Spirit, but we need to humble ourselves and ask for His strength. So often we can become self-righteous and try to win favour through our works, but God’s way is not through our ability, but through His. In fact I think God gives us impossible situations just so we are fully reliant on Him. Once we ask God to help us and empower us we need to then comply. Obey and do what He tells us to do. The Lord told me some time ago to spend the first part of my working day in prayer and communion with Him. I was fine with this until He told me not to start work until 10am. I have to be honest and tell you I had a little argument with God over this. You see, I’m a doer and I like to go into my office at home as soon as I can, and get stuck into my work. The school day is not that long and before I know it my family is home vying for my attention. Time is short! I truly think we forget that we are meant to live out our daily lives in and through God’s strength. He’s designed us to live in partnership with Him, yet so often we get tired out, stressed out trying to live for God on our own. 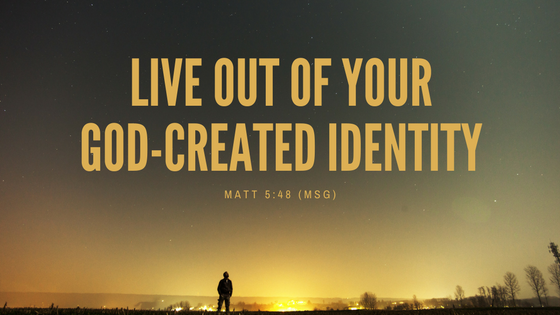 I am recognising more and more the importance, that to live our lives as God intended us……to “be perfect, as our heavenly Father is perfect,” we must embrace our “God-created identity.” That’s God in me, God through me, God percolating in me, God working in me. God shining through me. Previous Are You Hearing But Not Listening? This is awesome and humble. Thank you.